A forest warrior or highwayman looking for warm cover when stalking the enemy should consider choosing the Rudolf Wool Cloak as their medieval outer garment. 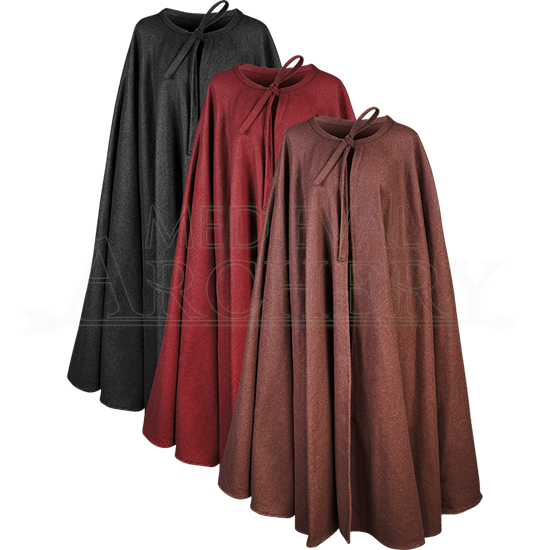 Unisex in three colors, this wool cloak layers easily with other clothing and can be removed quickly for unexpected battle. A tie closure secures the wide cut cloak to the body at the neckline. This medieval cloak keeps the wearer warm during winter fantasy or LARP events. Handwashing this item is recommended. Do not dry in the dryer. Do not bleach.